Last weekend , Singapore was experiencing one of the hottest weekend for the year. 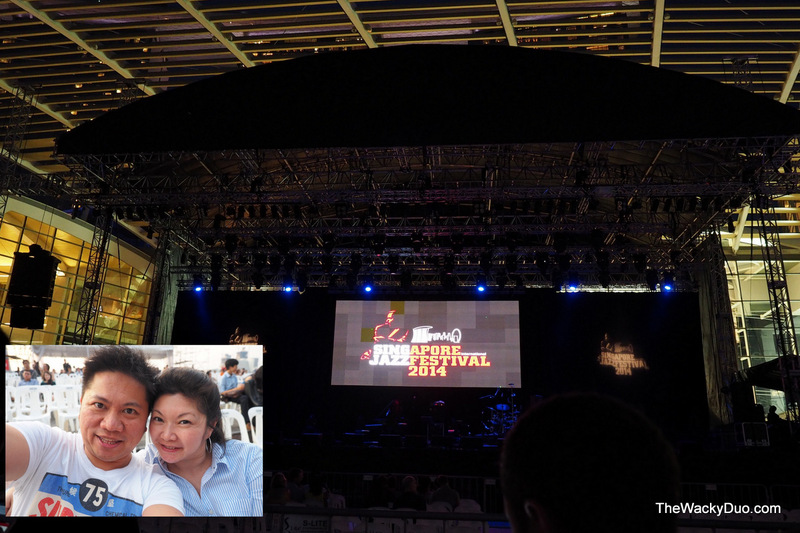 No, we are not talking about the heat wave but rather the the debut of Singapore Jazz Festival. This being the first Jazz Festival on our shores , we were naturally hype to watch the performance. We had the Sunday slot and we had UK Jazz Masters (Alemat Fernandez, Richard Jackson), Roberta Gambarini, Roy Hargrove, Gregory Porter and the headliner Earth Wind & Fire experience. This inaugural event is held at Marina Bay Sands. There were concerts held at the Grand theatre and Event Plaza. The event we attended was at the Event Plaza. It was early evening when we reached and the crowd was strolling in. We initially thought we would be able to catch the whole event. However this is a Marathon Jazz Festival with the first act starting at 530 and the last set ending close to midnight. Unfortunately time was not on our side as due to parenting commitments, we can only stay for 2 acts. Although we enjoyed the performance, we felt it lack a kick. Perhaps due to the lesser crowd ( most came after 8pm ) or the fact that Roberto had performed the night before, the set and the repertoire sounded more like a rehearsal than a performance. During one of the breaks we actually caught a glimpse of Roberto in her gorgeous gown the evening before. Somehow the causal setting for this performance seemed a little underwhelming in the huge stage. Nontheless the crew was tight as they cruise through the numbers. The fiesty Italian even performed a set with vocals mimicking the saxophone. Hailed as one of the best jazz vocalist in fifty years, the raspy voice charmed the crowd as the sun sets. Stting under an open sky and listening to lay back tunes made this a perfect date for us. Truth be told, it has been a while since we were out for a decent date, thus this was a welcoming setting for a romantic evening. A nice cool beer would have cap an evening well spend... The night arrived when Roberto finished her set. The night ended for us, but the music played on. The setting at MBS events plaza was good for a cozy audience. We were reluctant to miss the headliners but parental duties call. There are also free events during Singjazz held at various locations at MBS. We spotted this set at the rink where couples were jiving to the tunes by Havana Social Club. Singjazz may have just found its roots in Singapore judging by the crowd that evening.